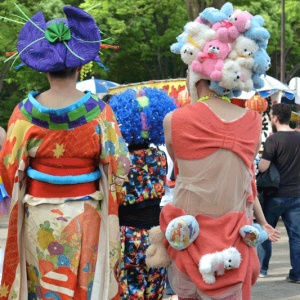 Yokohama Carnival is a lively event in Yokohama, Kanagawa Pref. A procession of Hamakoi-odori (local dancing originating in Yokohama) is held at the traffic circle near West Exit of Yokohama Station from 4 p.m. to 7:30 p.m. on the 22nd. The highlight of the festival is Hamakoi-odori contest held on the stage set up in Sawatari Chuo Koen (park) from 11 a.m. to 8 p.m. on the 23rd. Access: The JR Tokaido, Negishi (the Keihin Tohoku Line) or the Tokyu Toyoko Line to Yokohama Station (West Exit), and then walk 8 min.